The PBX SIP Trunk - Standard plan enables your business to dramatically reduce costs (up to 40%) while taking advantage of the latest VoIP technologies. 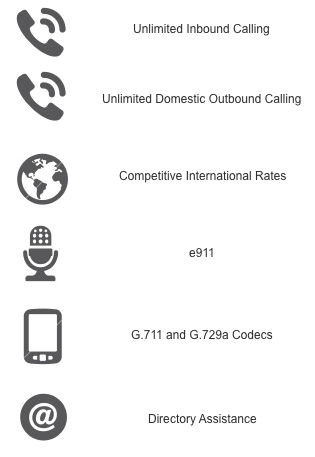 With UNLIMITED outbound domestic calling included, your out of pocket costs are minimized since you can leverage your existing customer premise based PBX or business phone system. Have multiple offices? PBX SIP Trunking is the perfect solution to centralize communications and eliminate wasted spending.